Measurements of magnetic fields are of fundamental importance in many studies of laboratory and space plasmas. The conventional spectroscopic technique to determine magnetic fields in plasmas is based on the detection of Zeeman spectral-line splitting in the presence of magnetic fields. However, Zeeman splitting pattern is not observed when the magnetic field has various directions within the observed volume, or when the field changes significantly in time scales that are beyond the temporal resolution of the detection system. Zeeman splitting is not observed also when the plasma density is high or when the plasma is very hot, such that the Stark and/or Doppler broadenings prevail. Our group has developed a new method that allows for magnetic-field determinations also in cases where the Zeeman splitting is not observed. The new method is based on the comparison of the magnetic-field-induced contributions to the line shapes of different fine-structure components of the same multiple (that have essentially the same Stark, Doppler, and instrumental broadenings). 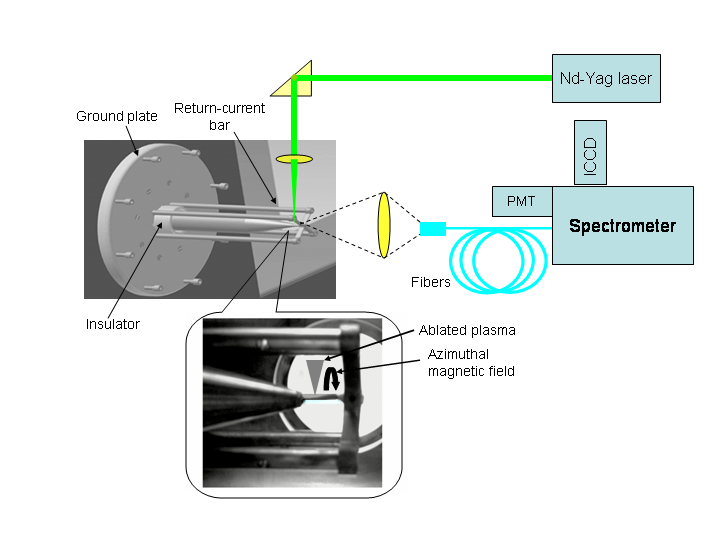 An experimental setup is designed for demonstrating and validating the new spectroscopic method under a wide range of plasma and magnetic-field parameters. The new setup is based on plasmas produced by irradiating solid targets with lasers, expanding against magnetic fields generated by means of a pulsed-power device inside a coaxial configuration. As seen in the figure, the target is attached to the inner electrode. The plasma expands mainly in the radial direction and interacts with the azimuthal magnetic field. This arrangement, combined with a spatial resolution of 0.5 mm and temporal resolution of ~10 ns of the diagnostic system, provide much flexibility in selecting the important parameters; namely, the plasma density and magnetic field, for which the spectra are recorded. The atomic system utilized for the magnetic-field diagnostics is the Al III 4s – 4p doublet at 5696 & 5722 Å. Fig. 2 demonstrates the transition from a standard Zeeman-splitting diagnostic to a diagnostic based on the new technique. Fig. 2a shows the spectrum recorded from a relatively low-density plasma at 4 mm away from the target, exhibiting a clear Zeeman-splitting in. The magnetic field can be readily measured from the line separation. The spectrum in Fig. 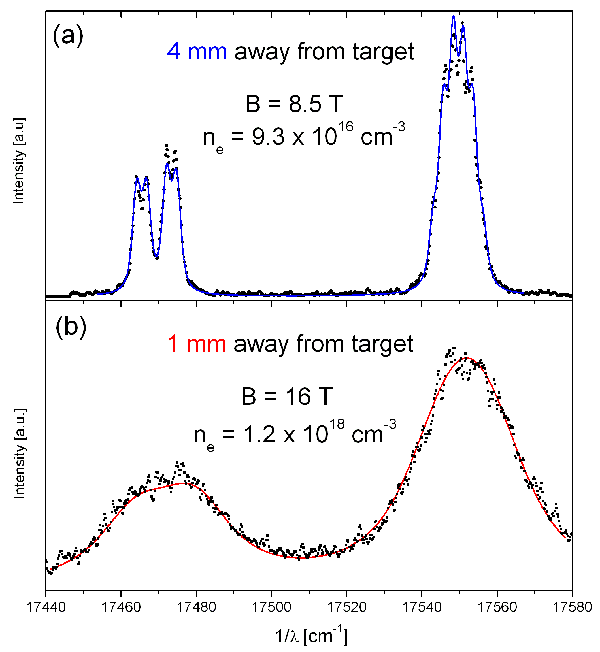 2b is obtained from a higher-density plasma, at 1 mm away from the target. In this case the Zeeman pattern is completely smeared by the Stark broadening and the magnetic field is determined by the new method, which requires detailed line-shape simulations.